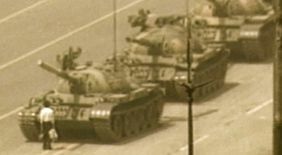 Tomorrow marks the 25th anniversary since the Tiananmen Square massacre in Beijing China. Hard to believe it has been almost half a lifetime since I was glued to the TV set watching this unspeakable horror unfold. The day remains crystal clear as I couldn’t believe what my eyes were ‘telling’ me. Unlike today, where news reporting is immediate from a multitude of platforms, in 1989 the news reports were still locked into neat broadcast packets at noon, 6 and 11 and (most) newspapers were slowly migrating to morning delivery. On the day of the massacre, news gathering for Tiananmen was coming in sporadically as the government was trying to shut down all communications to their country and to the west. Still Torontonians anxiously waited by their TVs as news trickled in; most in part to the number of foreign attachés and journalists still remaining in Beijing. Radio filled the gaps as it barked out ‘this can’t be happening’ everyone everywhere clamoured for a rare glimpse on TV. And then it came. The one iconic TV grab of a lone student facing-down a tank in what appeared to be a stand-off. If a stand-off is really even possible with 68 tons ready to roll over you. This image continued to hold some sort of vestige hope that this unbelievable and incomprehensible event may end quickly. After all, were not all communist regimes in 1989 moving towards some sort of Glasnost? Didn’t the generals have sons and daughters too? Sadly, this was not to be the case. Casualties continue to be disputed until this day. Was it 500 or 2,500? Only the victim’s families know for sure as their loved ones carry the weight of thousands in their hearts. This Wednesday the 4th of June let’s keep this memory alive for Jiang and all the others and with the help of social media, never let the story die.